The CAT Visitor Centre Shop offers a truly eco shopping experience. 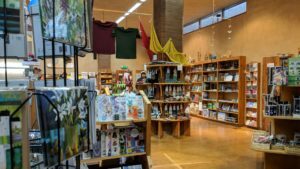 The shop is housed within a state-of-the-art rammed-earth building, designed to use locally sourced materials and have a low impact on the surrounding environment. 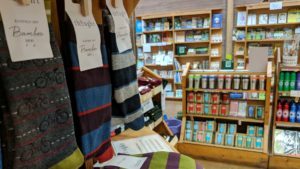 The shop is packed full of a wide variety of books on the topics taught at CAT such as organic gardening, sustainable building, renewable energy and wildlife and biodiversity. Other products include environmentally friendly items for your home and garden, toiletries, gifts, greetings cards and souvenirs to remind you of your visit to CAT. There is also a range of kits and toys that are powered by water, wind and the sun. The shop stocks all CAT books and publications and contains many other titles on a wide range of subjects.